For a long time it has been a dream to revive the history of Danish vintage motor racing and, in particular, beach racing. In the years 1919-1924 the island of Fanø gave home to some of the most legendary riders and drivers Europe had to offer. Makers such as Mercedes, Citröen, Fiat, Opel and many more were represented, although almost all were in the hands of private daredevils. Sadly the races on the beach of Fanø came to an end, with the tragic death of a 15 year old boy, by a tire loss from the wheel of Sir Malcolm Campbell's Bluebird racer. Campbell did, however, set records at over 130mph on the 1km stretch. 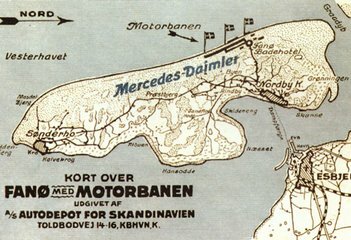 In the same years, races were being arranged on the west coast of Jutland, but was eventually shut down due to local regulations. Fast forward to modern times, a group of enthusiasts in the hot rod & custom community has finally succeeded in landing the necessary approvals for a vintage style race on the Island of Rømø.